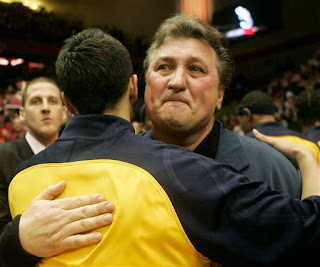 By 'Why We Should Root for West Virginia', we obviously mean why we should root for Bob Huggins. It's a complicated issue. So complicated, that tomorrow there will be a 'Why We Shouldn't Root for West Virginia' entry. That's right, we are breaking this thing down from all angles. Put on your scuba gear, because we are getting deep. That was stated up at the top yes, but it's worth pointing out and going in depth about. In fact, I'm breaking out the numbers, creating chaos. Bob Huggins was the greatest coach in Cincinnati modern history. He brought us titles in the Great Midwest and Conference USA. He raised Cincinnati's profile so, that UC was offered a spot in the Big East. That's been a huge boon for the football team. More importantly, he made the C stand for something. He took us to the NCAA Tournament from 1992-2004. He took us to the Final Four. He took us to 2 other Elite 8s as we all know. Him taking West Virginia to the title would almost be cathartic. It would be like Cincinnati winning the National Title. He's one of our guys, and don't you always have to pull for our guys to win? He brought in All Americans like Danny Fortson, Kenyon Martin, and Steve Logan, and has built up a roster like some old UC teams. They play just like late 90s UC did, and it brings back some memories. If only he broke out the 1-3-1 to beat UK more at UC. Lastly, he wears a track suit. I mean, how ridiculous is this? How can you hate on the man, when he doesn't care about how he looks? How can you not laugh when he's dressed like a gym teacher? They are from the Big East. Conference pride. We can't let the ACC, Big 10, or the Horizon league win the title. It has to come back to the Big East. The Big East is the best conference in basketball. The Big East struggled a whole lot in the Tournament. What better way to shut up the morons who say the Big East was overrated, than a Big East team winning the title? Da'Sean Butler has become one of my favorite players to watch. He may not have NBA skills, but he is a damn fine college player. He was huge in slaying the dragon known as Kentucky, and that alone should have earned him a space in your heart. He was called by Bob Huggins 'the best player he ever coached.' High praise. Really, that's where they live. What the hell is there to do in West Virginia? Wear coonskin caps? Kiss your cousin? Hike the mountains? Make some moonshine in your bathtub? Are some of these things about Kentucky as well? Yes, but there is no difference between them. Especially everywhere in Kentucky east of Lexington. And south of Lexington. Actually, all of Kentucky that's not Lexington or Louisville. Anyway, they burn couches in West Virginia. Burning couches is pretty cool.